Online Badli Camp Application form is available for Banaskantha and Bhavnagar District. Eligible candidates can apply online through below direct link. Update 23 June 2018: As per schedule, Dpegujarat online badli order will be declared on today for Phase-II. 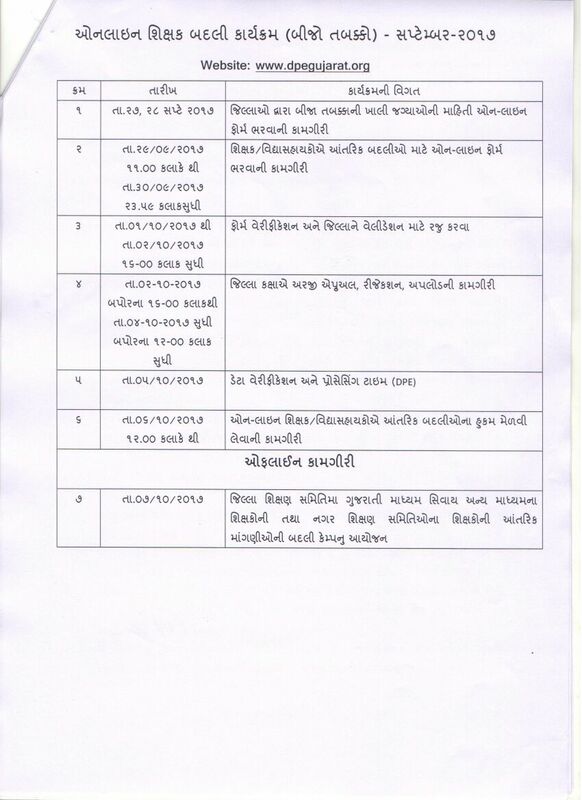 Candidates can download their Phase 2 order through official website dpegujarat.org or below direct link. Breaking Updated on 05-June-2018: Online Teacher Badli (June-2018) Phase 2 Schedule has been released on today. Latest 28 Sept 2017: Online Badli Round 2 canceled. Navi Suchna Na Male Tya Sudhi Sthagit Rakhva High court No Aadesh. Update 25 Sept 2017: Online Badli Phase I Status (Order Allotment) has been declared at www.dpegujarat.org. Teachers can download their Allotment Status PHASE – I by entering Application number and date of birth. Enter Your Details and Upload Photo & Sign. The governmentt of Gujarat Education Department has Started Primary Teacher Online Badli website. All Candidate who interested for Badli can visit this website. Primary Teacher Online Badli 2016 official Notification declared on today, 07 August 2016. Candidates are advised to keep visit this page for more updates and information. Candidates can apply online form 10-08-2016 to 12-08-2016 through official website dpegujarat.org After submit an online application you can also submit a print of application and document at TPEO office on or before 13-08-2016. After a Long wait, the Gujarat Education department has finally released official date of Online Teacher Transfer (Badli) 2016. The Official website of Teacher Transfer is www.dpegujarat.org. Any information please contact 079-23256592. Online Badli Registration will be start form 10-08-2016 to 12-08-2016. Online Badli 2016 Second Round Application available form 23-08-2016 to 25-08-2016. Below are the steps to Apply online. Last Update (20-08-2016) : Department Published Gujarat Primary Teacher Online Badli Second Round 2016 Notification and Instruction.